This new full-color XDF image offers an improved portrait of the deepest-ever view of the Universe and contains about 5,500 galaxies. The new full-color XDF image is even more sensitive than the original Hubble Ultra Deep Field image, thanks to the additional observations, and contains about 5,500 galaxies, even within its smaller field of view. The faintest galaxies are one ten-billionth the brightness that the unaided human eye can see . Magnificent spiral galaxies similar in shape to the Milky Way and its neighbor the Andromeda galaxy appear in this image, as do large, fuzzy red galaxies in which the formation of new stars has ceased. These red galaxies are the remnants of dramatic collisions between galaxies and are in their declining years as the stars within them age. This video explains how astronomers meticulously assembled mankind’s deepest view of the universe from combining Hubble Space Telescope exposures taken over the past decade. Guest scientists are Dr. Garth Illingworth and Dr. Marc Postman. 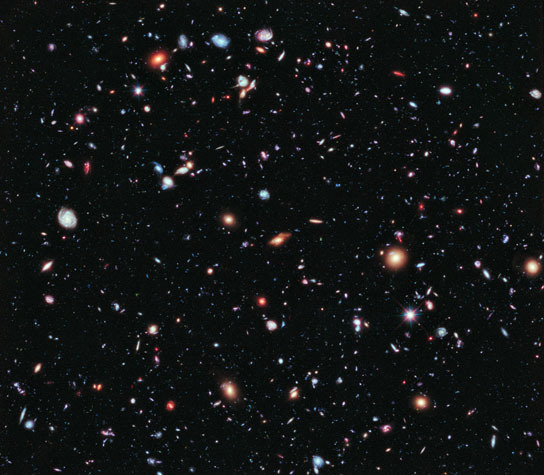 2 Comments on "New XDF Image, The Deepest-Ever View of the Universe"
It seems odd that if this photo shows galaxies that are fully formed and some in late stages of their life, that they could have formed .5 billion year after the big bang. I’m wondering if scientist are taking into account the expansion rate of the Universe. Not just the rate, but the rate of acceleration. If the expansion of the Universe is accelerating, then it’s been accelerating since the Big Bang, which would mean that the Universe is older than was thought before the discovery that the expansion is accelerating. The Big Bang may not be the correct interpretation of the formation of the Universe. Maybe Halton Arp was right.